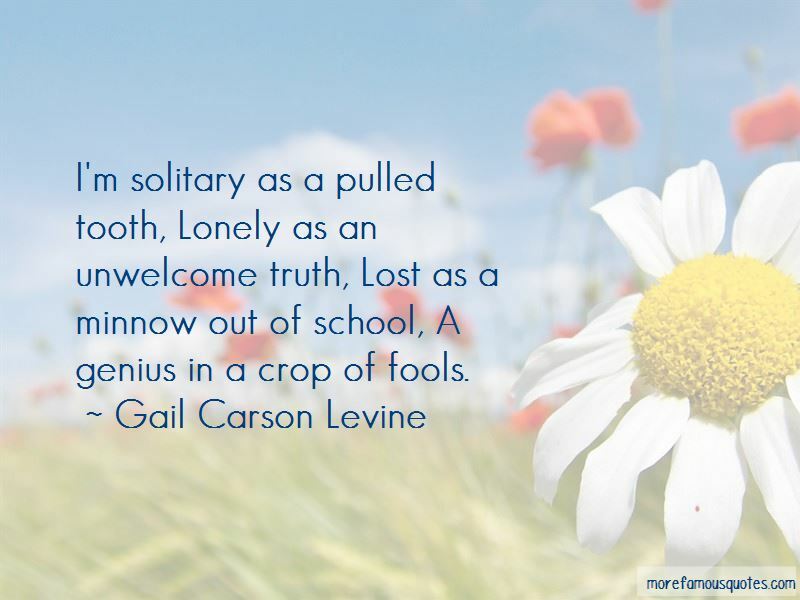 Enjoy the top 115 famous quotes, sayings and quotations by Gail Carson Levine. “I put my fingers around the unmarked ring of the spyglass and twisted. The scene became clear. Oh no! A hairy brown spider clung to a vine! I couldnt go there! Id go to the desert to find a dragon. I began to reset the spyglass, but then I stopped myself. A spider was worse than a dragon? A library is infinity under a roof. It is helpful to know the proper way to behave, so one can decide whether or not to be proper. That's funny, you're funny. I like you, I'm quite taken by you. I put my fingers around the unmarked ring of the spyglass and twisted. The scene became clear. Oh no! A hairy brown spider clung to a vine! I couldn't go there! I'd go to the desert to find a dragon. I began to reset the spyglass, but then I stopped myself. 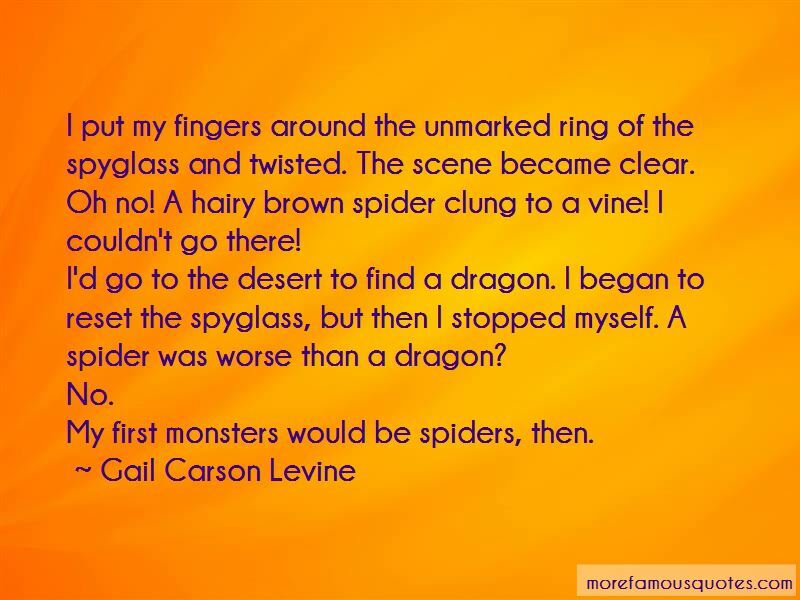 A spider was worse than a dragon? My first monsters would be spiders, then. “He stopped and took my hand. "If we die, or if I die ... "
He was speaking of dying, and I couldn't stop smiling. In the dark he must not have noticed, because he said in a rush, "I must tell you that I love you, and if I live I will ask for your hand, but you needn't say anything now if it distresses you, and I might rather die without knowing that you don't love me if that's how you feel." I tried to speak, but nothing came. I had gained courage during my adventures, but not for this. Too soft to hear, I whispered, "I do love you." 3. to nurture the writing of others. If I couldn't sleep, I could read. I didn't want to be a writer. First I wanted to act, and then I wanted to be a painter like my big sister. Most of the authors I liked were dead, so it didn't seem like a safe occupation. Sometimes the kids come up with better endings than the real story. “Luck was with me. I saw no spiders. Although we didn't invite Lucinda, she arrived anyway-with a gift. "No need," Char and I chimed together. "Remember when you were a squirrel," Mandy said. until I crumple your letters up in despair, only to smooth them out again for a twelfth reading, hunting for hidden meanings. “The fast fliers are not disgraced." Queen Ree reached up for the missing tiara. "She saved us, but she's with him now." “No sign of pleasure greeted the announcement. The mood in the hall was leaden. “AhthOOn SSyng!" I said. "That's farewell." “Char saw me. Over the shoulder of his partner, he mouthed, "Wait for me." Drualt took Freya's warm hand, Her strong hand, Her sword hand, And pressed it to his lips, Pressed it to his heart. Come with me,' he said. Come with me to battle, My love. Tarry at my side. Stay with me When battle is done. Tarry at my side. Laugh with me, And walk with me The long, long way. Tarry with me, My love, at my side. Writing is a weird thing because we can read, we know how to write a sentence. It's not like a trumpet where you have to get some skill before you can even produce a sound. It's misleading because it's hard to make stories. It seems like it should be easy to do but it's not. The more you write, the better you're going to get. Write and write and write. Try not to be hard on yourself. 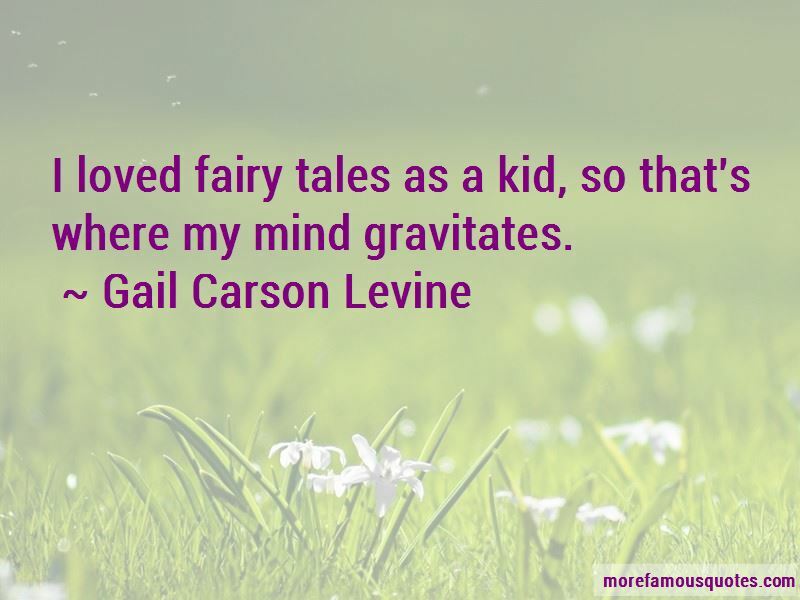 Want to see more pictures of Gail Carson Levine quotes? 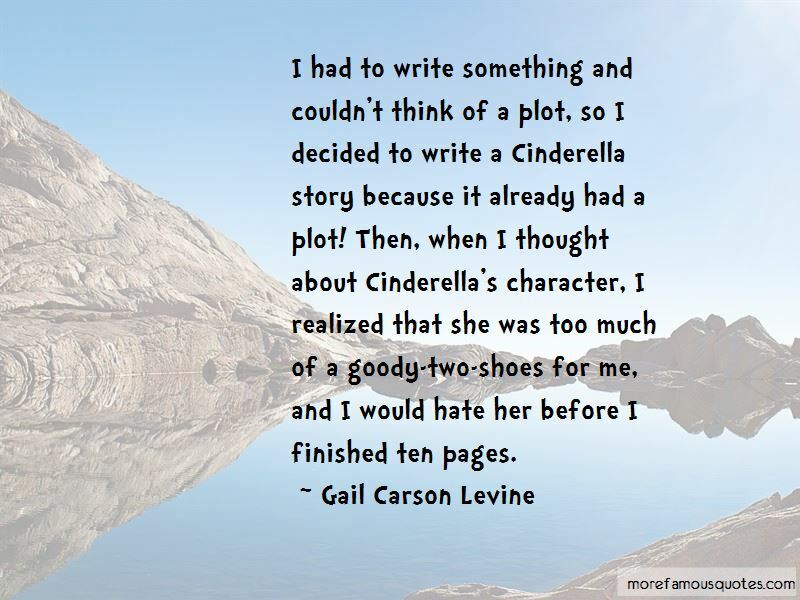 Click on image of Gail Carson Levine quotes to view full size.